Maxidix Hotspot will turn your computer with WI-FI adapter into a real Access Point. Host infrastructure network (not ad hoc) in one click. Maxidix Hotspot supports dual-mode: host infrastructure WI-FI network and connect to any other WI-FI network simultaneously, using a single WI-FI adapter. Share Internet via your hotspot from any network connection available: Mobile connection (GPRS/EDGE/3G/4G), Bluetooth, LAN, Dialup or even other WI-FI network (thanks to dual-mode). Keep track of connected devices in real time. Limit the maximum number of devices which can connect to your hotspot. Do you have more than one device? Save money on paid Internet spots. Connect your computer and share Internet to any number of your devices. Setup your hotspot parameters once, and forget about manual starting each time your computer turned on. 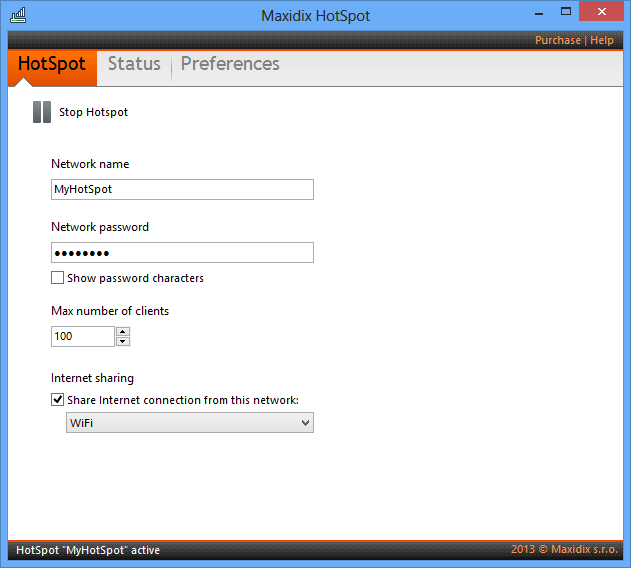 Maxidix HotSpot allows you to use your computer as a repeater also. Place one computer closer to the weak signal, start your own hotspot and connect other devices to it.